Tonight's review is for a stick that comes with a little story. My partner at Cigar Explorer Mario attended a charity event in New York a few weeks back which was hosted by Carlito Fuente. I'm sure Mario took video of the event, but he has been very busy and is back logged with videos at this time. Anyway, during the after party at the Grand Havana Room, Carlito handed Mario a couple of these cigars and said, "Nobody has this one." What does that mean? I don't know. What I do know is Mario saved one for me, so I'm thankful to him for that. 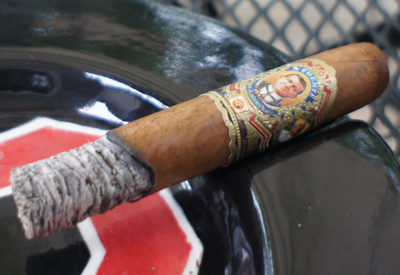 From doing some Google research (I will readily admit that I'm an amateur regarding Fuente products), this cigar looked like the Arturo Fuente Don Gran AniverXario Natural. 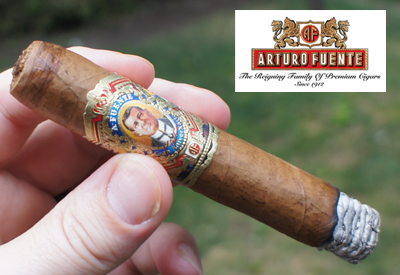 Some early history on Arturo Fuente Don Gran AniverXario Natural from a Old Prometheus press-release via Halfwheel: Carlito Fuente has created a new cigar, Don Arturo Gran AniverXario, in tribute to his grandfather, Arturo Fuente. These cigars are made with the legendary wrapper leaves from Chateau de la Fuente, the birthplace of a dream. Carlito Fuente made Don Arturo Gran AniverXario cigars in 2001 to celebrate the 100th Anniversary of Arturo Fuente Cigar Company, which was founded by his grandfather in 1912. He planned to release Don Arturo Gran AniverXario cigars every year, starting in 2002, to celebrate the 100th Anniversary. However, these cigars were never released. Don Arturo Gran AniverXario cigars have been aging in the Fuente aging room since 2001. These 7-year-old cigars will finally be presented in the Limited Edition Fuente Story Humidors produced by Prometheus. 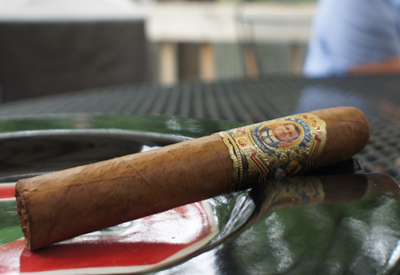 So, with all that said, I don't even know if this cigar is the previously-released Arturo Fuente Don Gran AniverXario. 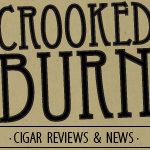 Could it be one of the delayed 100th year Anniversary cigars that are not coming until 2013? Speculating is something fun, but in the long run, really doesn't mean anything. For the purpose of this review I'm simply going to call it Gran AniverXario. The band on this cigar was awesome. I know...I bet I surprised you, given my tendancy to go for the less-is-more approach to cigar band art, but this one really just worked. There was so much going on -- from the portraits to all the symbols -- yet, to me, it really does look like a well-executed, classic Cuban design. The wrapper was a peanut butter brown color with lots wood spalting characteristics. Easily put, it looks old. There were medium-sized veins running around the leaf, but because the wrapper appeared to be thick, I didn't anticipate any burn issues. The unlit aroma had notes of raw honey and walnuts. The cap clipped without issue and the cold draw had a lot of sweet, sugary flavors with the walnut creeping back in. Right out of the gate, my Gran AniverXario produced a lot of strong flavors. The front of the taste profile had a thick raw honey flavor mixing with a twangy sugary sweetness and some wood notes. The finish was a powerful black pepper flavor that was spicy but lacked any mouth burning and was easy on the taste buds. It's only the first third, but wow. This cigar was impressing me. The draw and the burn were perfect; the ash, although looking pretty weak, did not fall even in the breezy weather we were having (Yay, it's not 100+ degrees!) I'd put the nicotine strength in the mild to medium range. The second third of my Gran AniverXario had a slight change on the front of the profile with some toast flavor elements mixing in, but they did not take away at all from the honey, sugar, and wood combo from the first third. The finish was consistent with the black pepper that lingered long between each draw. I know that is a lot of different flavors in my description, but I really was getting all of them and getting them strongly. 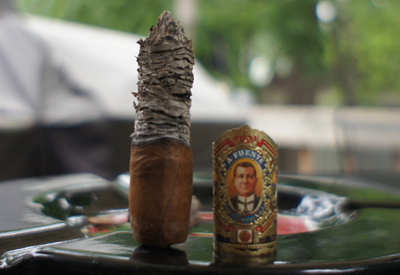 This cigar was pumping out so much flavor, it was hard to not rush smoking it. Once again, no problems with the burn or draw, and the ash only fell right before reaching the band on the stick. The nicotine strength moved up a bit in the second third and I would call it medium. Just when I thought I had this stick figured out, the final third threw another thing into the ring. The front was still producing all the flavors I mentioned above, but the finish now added a tart grapefruit note just after I exhaled. It lasted a very short amount of time before fading into the black pepper from before, but it was definitely there and seemed to work well as a buffer between the sweet front end and the spicy back. I only ashed this cigar once before burning it all the way until my fingers were hot so yeah: constuction doesn't get much better than that. The nicotine strength stayed in the medium range. 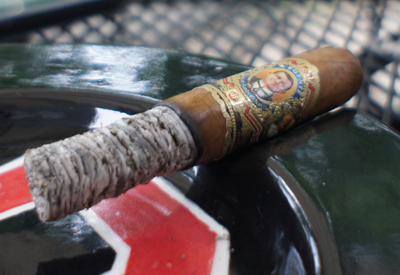 Final thoughts on the Arturo Fuente Don Gran AniverXario? This was one hell of a cigar. Like I admitted, I am not a Fuente expert, but I have smoked my fair share of Anjeo and Opus X. For me, this cigar blew any of the ones I have smoked previously out of the water. Tons of full on strong flavors and great balance, even with the complexity. This is in the top five cigars I have smoked this year so far. Would I buy a box? This (if it's an old Gran AniverXario or a new one) is a very pricy cigar. But if money was no option I would buy a box in a heartbeat.